Dinner at Chloe, the new restaurant from Chef Haidar Karoum (formerly of Proof, Estadio, and Doi Moi), leaves me with the feeling that I am missing something. It isn’t the food. I thoroughly enjoy everything I eat. It isn’t the service. The wait staff is competent and quite pleasant. It takes me some time to put my finger on what’s bothering me. And then it dawns on me. It’s where we are seated. Our table, at the front of the restaurant, gives us a clear vantage point of the bar area to the left. I can make out the counter and an open kitchen straight ahead, but we aren’t close enough to immerse ourselves in the feel of the place. I feel out of the mainstream, and as an extrovert, I prefer to be in the thick of things rather than on the outside looking in. The good news is that the experience compels me to return to Chloe just a few weeks later, this time for brunch. 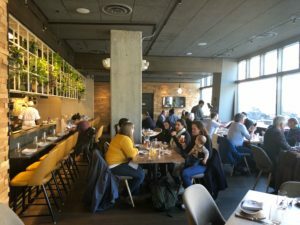 I am able to sit at the counter overlooking the kitchen, and although Chef Karoum isn’t in the restaurant, I felt like I have consummated the relationship. And yes, I am fulfilled. The menu at Chloe is an interesting amalgamation of cuisines that reflect the background and experiences of the chef. Karoum has Lebanese roots, and some dishes incorporate Middle Eastern flavors. He has also traveled throughout Western Europe and Southeast Asia, and ingredients with those flavor profiles also take a seat at the table. The decor is clean and modern, with floor to ceiling windows overlooking the rapidly growing neighborhood of The Yards. An overhang between the counter and the open kitchen is studded with greenery- a focal point in a restaurant where design doesn’t overwhelm the food. Dishes at Chloe are meant to be shared. If you are here with vegetarians or pescatarians, you can breathe a sign of relief, as there is plenty to enjoy. 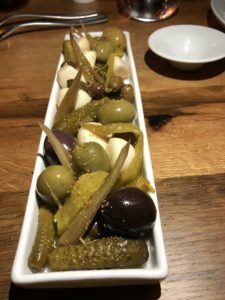 Start with a pickle plate – tart, spicy, simple, a fun accompaniment to cocktails or wine. 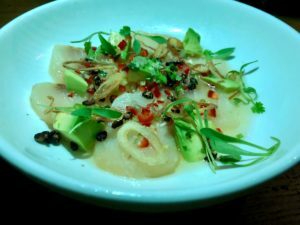 Cobia Crudo is bright and lively with avocado, Thai chilies, and puffed black rice providing punch and crunch. Are we tired of crispy cauliflower with tahini yet? I’m starting to grow weary of the pairing, but this doesn’t stop us from ordering and enjoying, the well-made version here. The incorporation of tahini, lemon, garlic, mint, parsley, and pine nuts into the dish exemplifies an effort at Chloe to showcase quality ingredients and skill, rather than make overly complicated food. More vegetable dishes to admire include baby bok choy, roasted kaleidoscope carrots and parsnips, and beet and quinoa salad with pomegranate, winter citrus, whipped goat cheese and zataar. We venture into heartier territory with seafood gumbo. It’ s a warm and satisfying blend of andouille sausage, peppers, scallions, and in a unique twist- sassafras. Designed for sharing? Not easily. But this isn’t a reason to steer clear. More in line with the divide and conquer approach is spice roasted chicken and crispy whole fish. 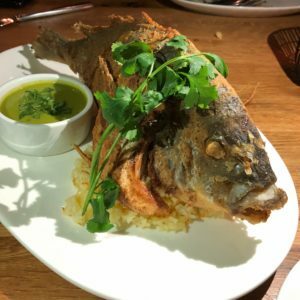 If cauliflower makes a regular appearance in our dining repertoire, the same can be said for whole fish. (One only needs to look back at a few of my blog posts for verification.) The fish meets my high standards with a crispy exterior and moist interior, and it excels further with zippy tomatillo salsa verde. I can’t control the urge to dive in for more. 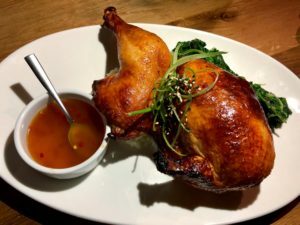 The roasted chicken is a beauty, and the toasted chili-lime dipping sauce that is served with it gives me something else to crow about. 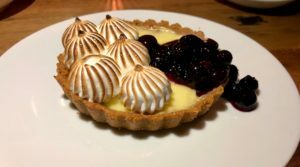 My first meal at Chloe ends sweetly, with a Meyer lemon tart majestically crowned with meringue and blueberry relish. When I return a few weeks later for brunch I am able to snag a ringside seat overlooking the kitchen. The restaurant is now brightly lit, and I have a better feel for the space. I am accompanied by my niece, who is on board with my desire to over-order. 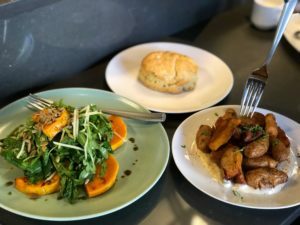 Crispy fingerling potatoes, Ivy City smoked salmon tartine, tortilla espanola, scallion biscuit, roasted butternut salad. We can’t come close to finishing a single dish, but we are happy enough to try. 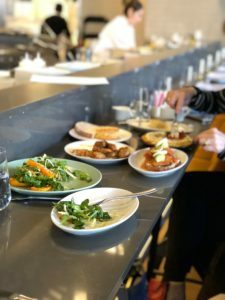 There is a consistent thread between brunch and dinner – Karoum aims to please with food that is credible and consistent. Chloe, which is named for Karoum’s niece and the Greek goddess of agriculture, is a lovely restaurant. You can craft a meal with flavors that best suit your mood, and return to create something completely different. Sit in the bar, at a table, on the patio when the weather warms, follow my lead and sit at the counter where you can really feel the pulse of the restaurant. It’s up to you. Just take a seat.